On the whole I prefer using Microsoft’s Internet Explorer to Firefox, but one of IE’s most annoying default features for me is that when you have a few tabs open showing different web pages and you want to click on IE in the task bar in Windows 7 in order to maximize IE and show the last web page you were looking, Windows shows a list of all your open tabs, forcing you to pick a specific tab. I’ve no idea why this is the default behaviour in IE as it mean you have to find the last web page you were looking at in the list then click again to maximise the web page in IE. However, you can change this behaviour and make IE work like Firefox and simply maximize with the last page you were looking at with one click on IE in the task bar. 2. Press the Alt key on your keyboard so that IE shows its main menu at the top. 3. Click on the Tools menu and choose the Internet Options menu option. IE will then show the Internet Options dialog. 4. 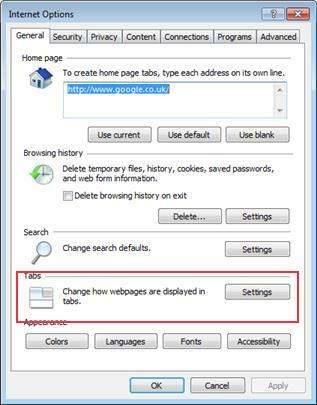 Click the Settings button in the Tabs section as shown in the picture below. 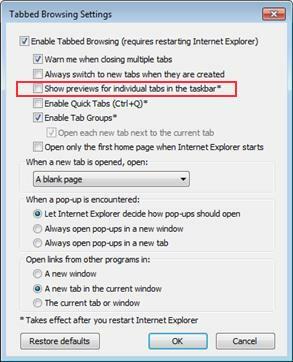 IE will then show the Tabbed Browsing Settings dialog. 5. In the Tabbed Browsing Settings dialog, uncheck the option “Show previews for individual tabs in the taskbar” as shown in the picture below. 6. Click OK to close the options dialogs, then close IE and reopen it. Now, IE maximises from the taskbar in a single click.